Onwards with the Mardi Gras theme! I can’t help but be happy when I think of Mardi Gras. I had my first bite of King Cake in the Big Easy at The Court of Two Sisters. Truthfully, there was a slight moment of disappointment, because when one hears the word ‘cake,’ you expect sweet cake. King Cake is more of a yeast bread with a cinnamon swirl and sweet frosting. And there’s nothing wrong with that! Please, love King Cake for what it is, not what you wish it would be. For these donuts, I converted a baked beignet recipe into donut bars, because let’s be honest: baked beignets taste like baked donuts. The key difference here is that these baked donuts are made with actual yeast, while most baked donut recipes rely on baking powder. I’m 110% sure you’re going to love these. I scaled down Jenna’s recipe for oven-baked beignets for this application, because Jenna is a girl who really knows her way around yeast—just ask her former culinary instructor! Oh, Jenna, I kid! I love ya! I love to make this dough because it’s so wonderful to work with. It starts out a tiny bit sticky, but after kneading, it’s supple and easy to knead. I topped each donut bar with cinnamon-sugar and sweet glaze with colorful sprinkles. Don’t forget to butter your plastic wrap! In a small bowl, combine the warm water and yeast with a pinch of sugar. Stir to combine. Let rest for 5 minutes until foamy. It MUST foam. If it does not foam, the yeast are dead. Start over. Meanwhile, whisk together the flour, 2 tablespoons of the sugar, baking powder, baking soda and salt in a medium bowl. Add the butter, and incorporate it into the flour by pinching it throughout the dough. You could also use two knives or a pastry cutter. The butter should be evenly distributed throughout the dough in small chunks about the size of pearl couscous. Next, stir the egg white and milk into the yeast mixture. Add this to the dry ingredients and stir until combined. Flour the counter, and place the dough ball on it. Knead the mixture for 3-5 minutes, or until the dough is no longer sticky and feels soft and supple. Flour the counter, your hands, and the rolling pin as necessary. 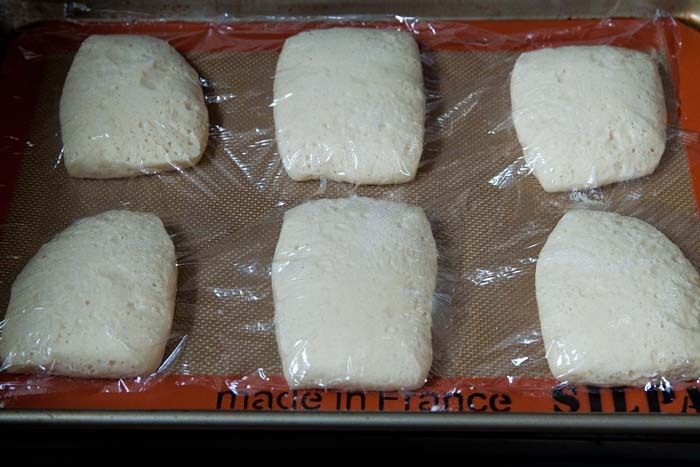 Cover the dough with plastic wrap and let it rest for 15 minutes. 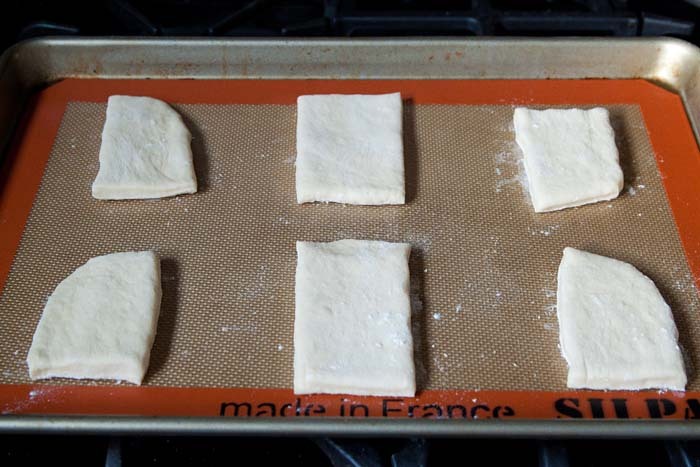 Next, roll the dough out into an 8â? square. Using a pizza cutter or knife, cut the dough in half, then in thirds to make six donut bar shapes. (See photo). Place the donut bars on a lined cookie sheet, and cover with buttered plastic wrap. Let rise in a warm place for 45 minutes. Preheat the oven to 400Â°. Sprinkle the donuts with the cinnamon and remaining 1 tablespoon of sugar. Bake the donuts for 10-12 minutes, or until lightly browned on all edges. Let the donuts cool slightly, then whisk together the powdered sugar and milk for the glaze. Decorate the donuts while still slightly warm with the glaze and sprinkles. Serve immediately. The donuts taste best right out of the oven, but can be kept for 1 day in an air-tight container. It's best to warm them very briefly in the microwave before serving. A small batch of BEIGNETS. Oh, it’s a bit too early for me to be thinking about sucking crawfish brains LOL. A cricket spitting bowl?! You have the best stories! I married into a family of Boiler makers, so I’m going to have to ask them about this curious deal! Ok delivery for these to my house will cost how much? 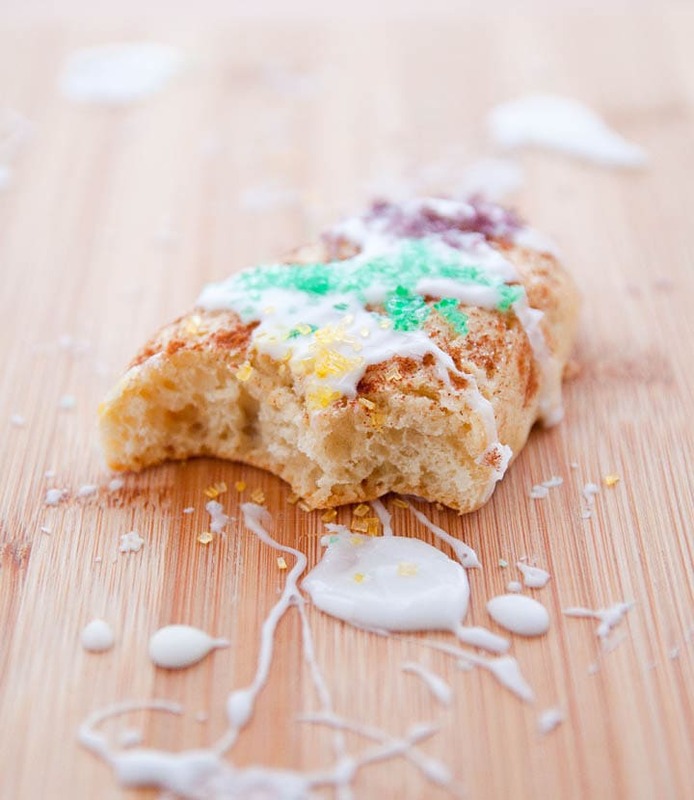 i seriously, icing and sprinkles on top of king cake donuts?! I’m IN! Looking at these makes me wish I baked with yeast more. 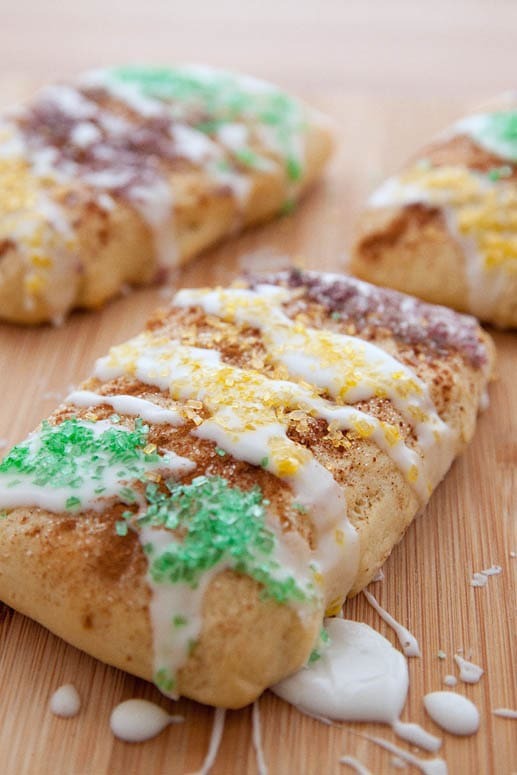 Love the idea to turn king cake into bars! LOVE this! Donut bars, yes please! It’s true! The Purdue Bug Bowl also has chocolate covered insects – I never partook in either the bug spitting or eating. They also have all the horticulture facilities open that weekend and I still have a cactus from when I went almost 15 years ago! Yes yes and yes to this! I love this spin on the king cake. You had me at donut! Perfect for Mari Gras! Donut bars?! I love you. you just made my day!!! Well don’t these look like two and a half sins ’til Tuesday?! SIGN ME UP for these!! These are so pretty! I think I need to start celebrating mardi gras. I mean, all things King Cake is a holiday I can get behind! These look all kinds of amazing! UTTER PERFECTION!!!! I want them all. No sharing! Ooooh, sign me UP! These look amazing, Christina! This looks SO GOOD!! Your photos are gorgeous! I JUST ordered a silpat mat online, and when it gets here, I would love to whip it out for this. Yum! SHUT THE FRONT DOOR. DONUT BARS?! I am dead. omg what a brilliant idea!!!! I love the idea of re-imagining such a delish treat! My mouth is watering just thinking about these! 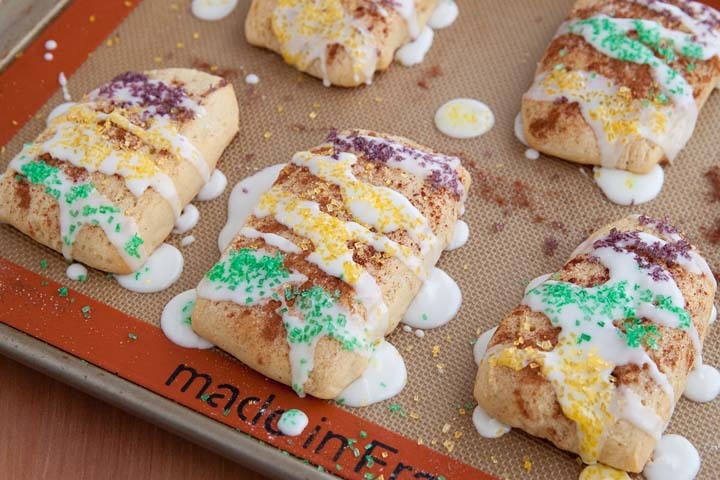 I’ve made Jenna’s baked beignets before but didn’t give them this King Cake flair! At least now I know what I’ll be doing this weekend. :) These are so fun! I’m loving your King Cake Donut Bars! Just need some cafe au lait to go with them for the perfect New Orleans breakfast! I’m in heaven … just pulled them out of the oven and they were to die for! So light and moist! I had a horrid time with the dough (probably because I chose to mix it in a food processor) … ended up having to cut in a good 1/4 cup of additional flour (dough was so wet I ended up using a pastry knife to turn / fold / knead) … aside from that they were simply wonderful! My only change was to double the cinnamon/sugar topping and to add a tablespoon or two of cream cheese to the frosting (just enough to take away that powdered sugar taste). Thank you SO much for recipe!